We were invited to stay at Tamar Lake campsite this August, in a ‘glamping’ pod. Tamar Lake straddles the borders of Devon and Cornwall- apparently the old border line falls in the middle of the lake! 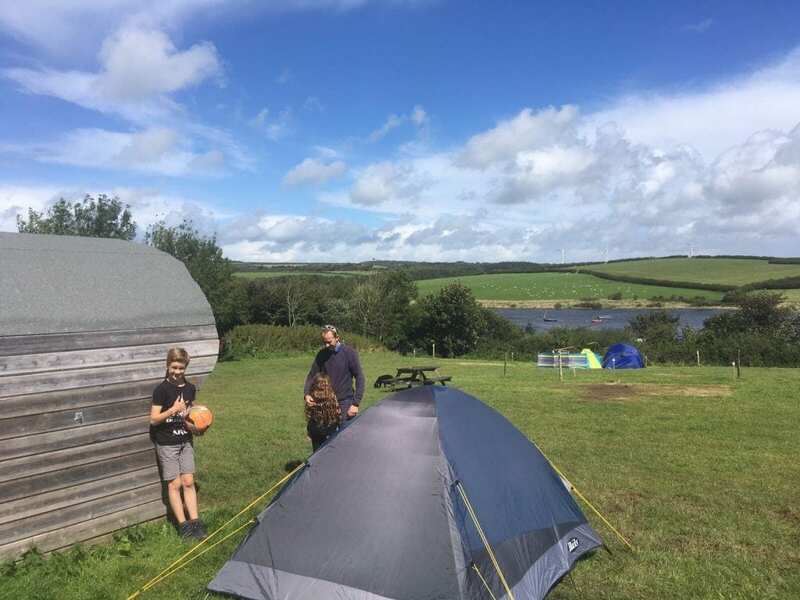 The camspite is in a beautiful setting overlooking the lake and has around 20 pitches for either tents or campervans, some with electric hook up. There are good shower and toilet facilities on site, although the water pressure in the showers was very low when they were all in use, and the shower blocks doubled up as changing rooms for the watersports centre on site, so I’d imagine they could become very crowded and probably quite dirty on busy days. There’s a great cafe on site serving breakfast from 9am and simple lunches of pasties, sandwiches and jackets, and some delicious cakes. 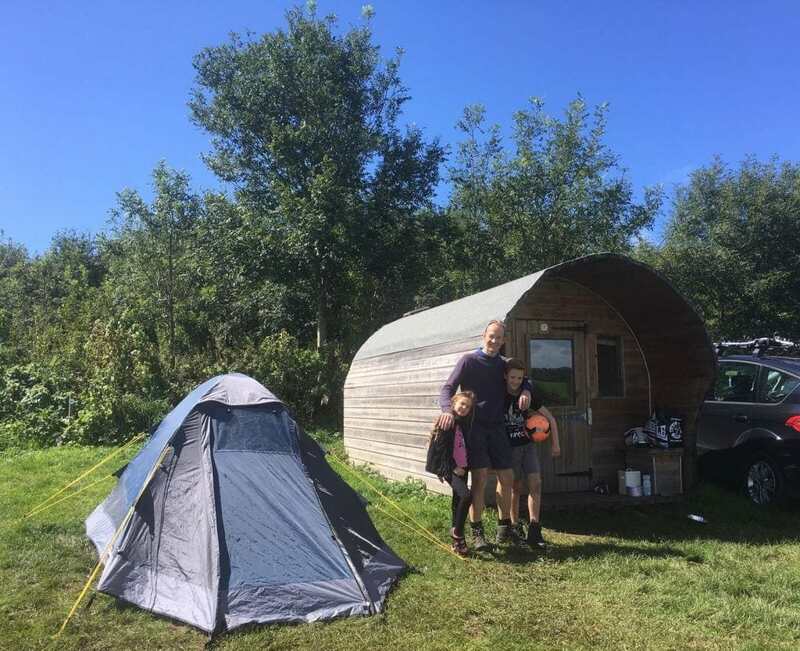 We stayed in the only pod on site – a pretty basic wooden hut with 2 sets of bunk beds, a small table and 4 chairs and a giant cool box inside. We were also provided with a washing up bowl and some cutlery (but no crockery). I was very excited to see that the pod had what seemed to be electric lights, but which we later discovered to be solar powered (when they abruptly stopped working as it went dark!). No dogs are allowed in the pod, and it only sleeps 4 and there are 5 of us plus dog, so we brought a 2-man tent with us as well and pitched it next door (there is plenty of space between each pitch). 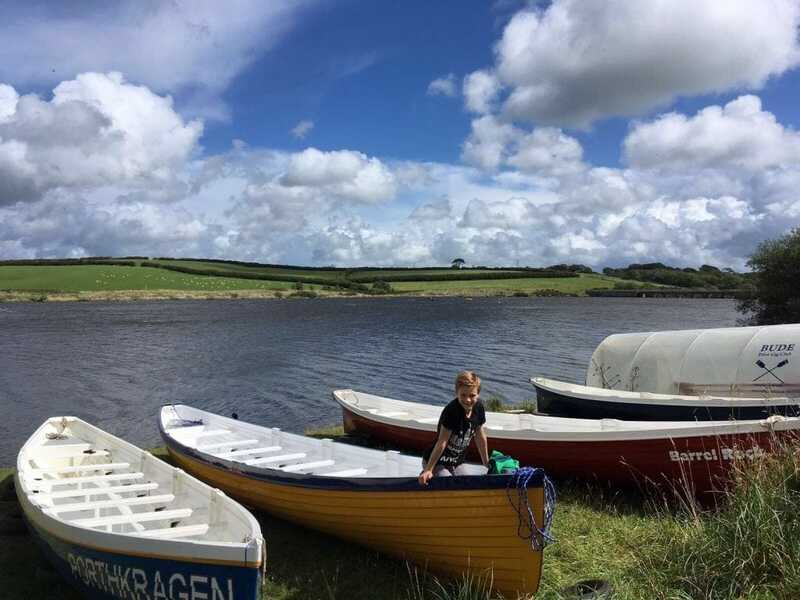 At one corner of the camping field, there is direct access to a pretty flat, 3-mile circular walking track around the lake, which is also suitable for all levels of cyclist, wheelchair users and buggies. We pitched our tent and headed off for a walk. We had fun picking lots of blackberries from the bushes surrounding the lake, and chatting to the fishermen and women who were camping at various designated spots on the lakeside. Fishing permits (day and overnight) are available from the site and tackle and bait are sold in the site’s cafe. 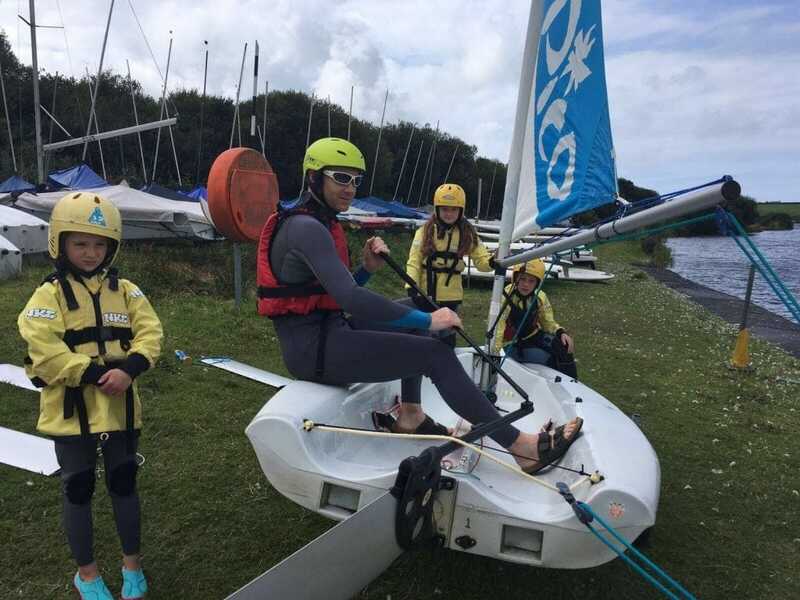 On the shores of the lake, a 30 second walk from the campsite, is Tamar’s Watersports Centre, offering a range of watersports including kayaking, sailing, windsurfing, rowing and standup paddle boarding. On Saturday mornings in high season, the watersports centre runs a kids’ club from 10-12pm. The club is run by excellent instructors who are clearly experts and who were brilliant with the children. They decide what activities to do at kids’ club on the day, depending on the weather conditions. 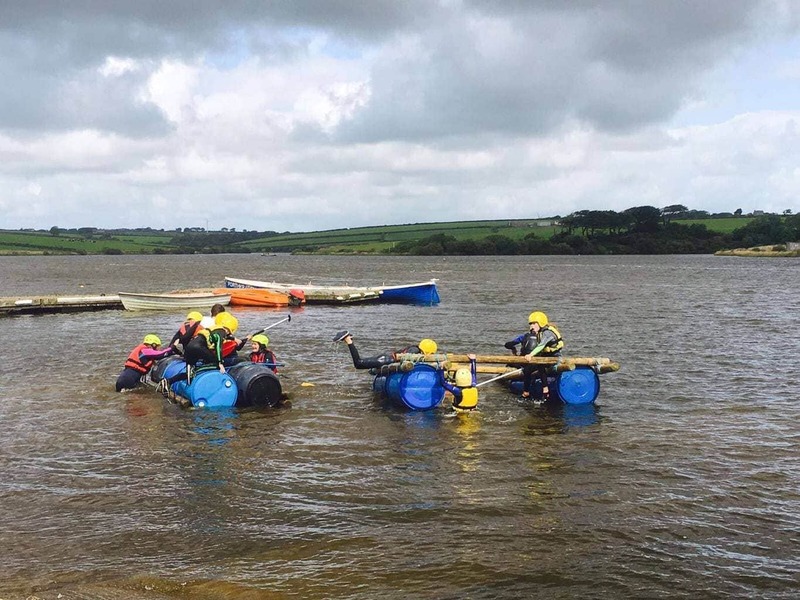 As it was too windy for sailing, they decided on raft building, which my 3 were delighted about. 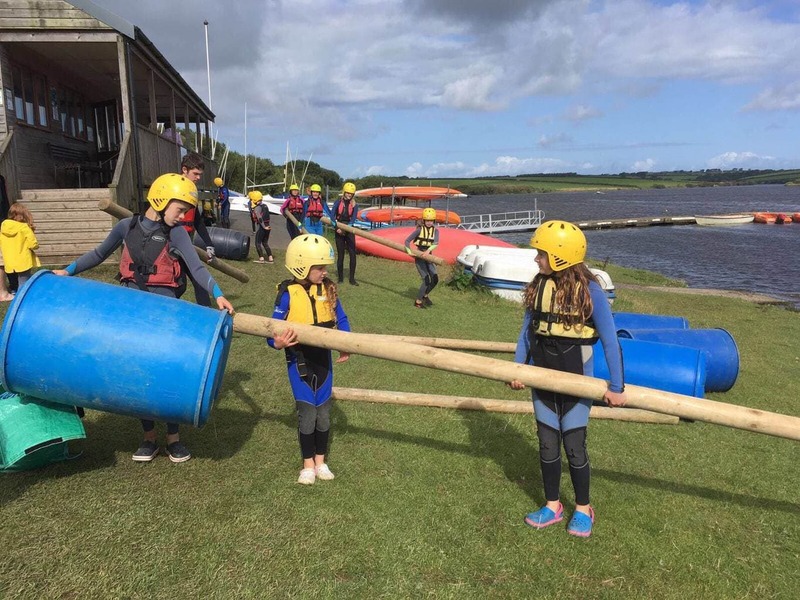 They organised the 12 or so children into 2 teams and they all worked together to build a raft from giant logs, plastic drums and rope. They then played a series of different games on the water in their rafts, which looked like great fun. Ed and I were able to do the 5km park run around the lake (which happens every Saturday morning) while the kids were happily occupied. After a quick lunch, we were back on the water for a private sailing lesson. We had some very clear tuition on the lakeshore by our brilliant instructor, Steph, and then we were let loose on the lake to put the theory into practice. Ed went in a boat with Rosie, Charlie and Mimi went together and I went by myself. It turns out that sailing is a lot harder than it looks (especially in a high wind!) and we had a hilarious hour or so trying to master steering straight and then turning without capsizing. I was all over the place, and performed a series of 360 degree turns whilst being repeatedly bashed on the head by the boom. 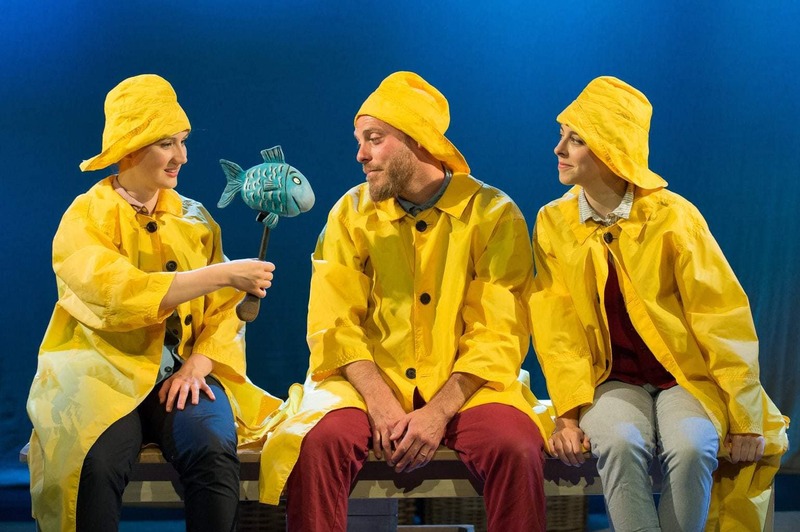 Ed capsized his boat within 5 minutes when he attempted a turn at top speed, so Rosie flatly refused to get back in. I was actually pretty relieved as it meant I could buddy up with Ed and Rosie had a lovely time in the speedboat with Steph, our instructor, taking pictures and laughing at us. Charlie and Mimi did absolutely brilliantly by themselves, and looked like little pros by the end! We were staying at Tamar Lake en route to a longer holiday in a house in South Cornwall, so didn’t have room (or the inclination!) to pack a load of cooking equipment for the camspite. So, we headed in to Kilkhampton, a village 4 miles fro the camspite, to the London Inn which serves excellent food. There are a number of shops for groceries in Kilkhampton, including a Co-op. The next morning, the wind had dropped quite a bit so we were able to take out kayaks and stand-up paddleboards and spent a happy couple of hours paddling around the lake. 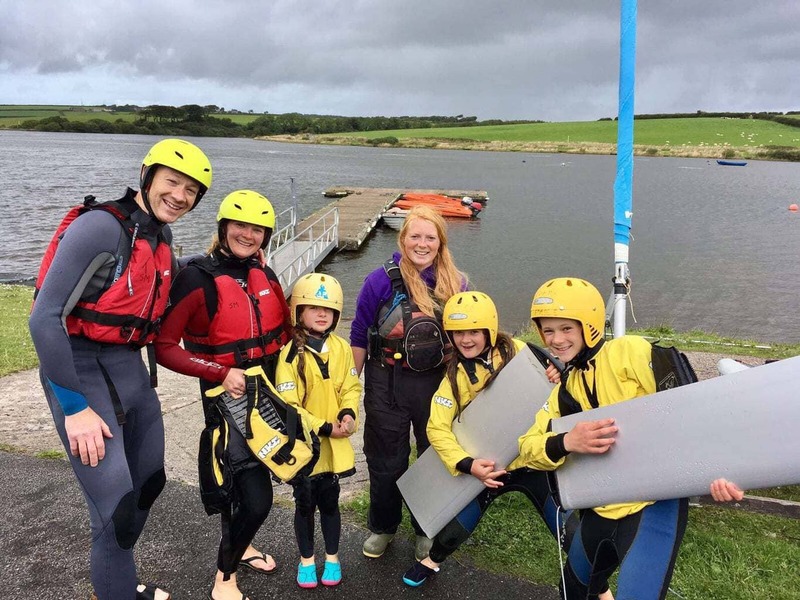 All equipment hire includes wetsuit and life jacket hire, and any other equipment needed. We had a wonderful stay at Tamar Lake, and would highly recommend the campsite. 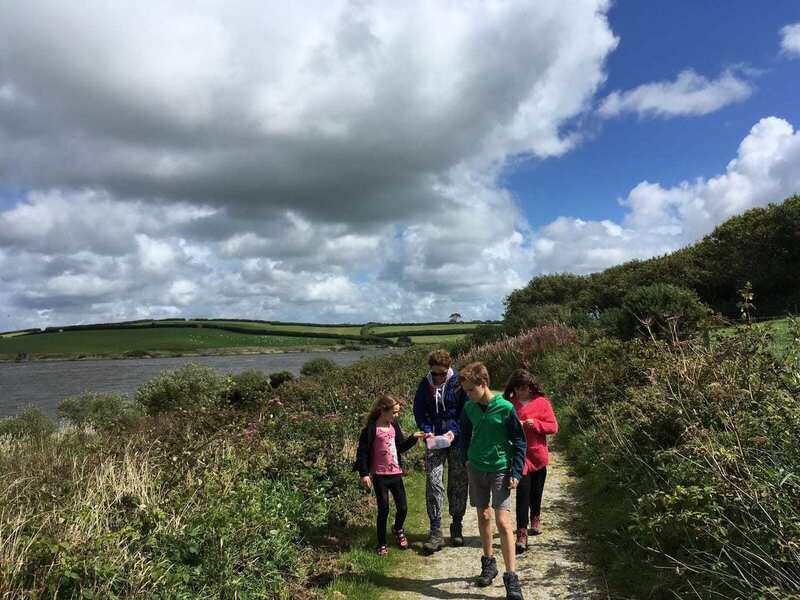 We didn’t explore the areas around the campsite as we were busy on the lake, but there looked to be plenty of wonderful places to visit, including Tintagel (castle of King Arthur). NB: Jane and her family were invited to stay at Tamar Lake but all views and opinions are her own. From the post, it seems that you and family had a lot of fun. This is a good camping destination for a family with kids as there are so many activities to do. 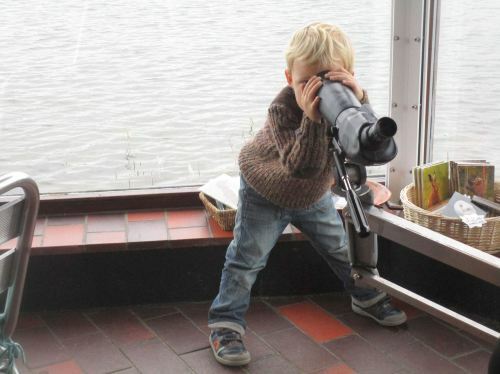 A great way to acquaint the children with the outdoor life, without limiting their comforts too much. 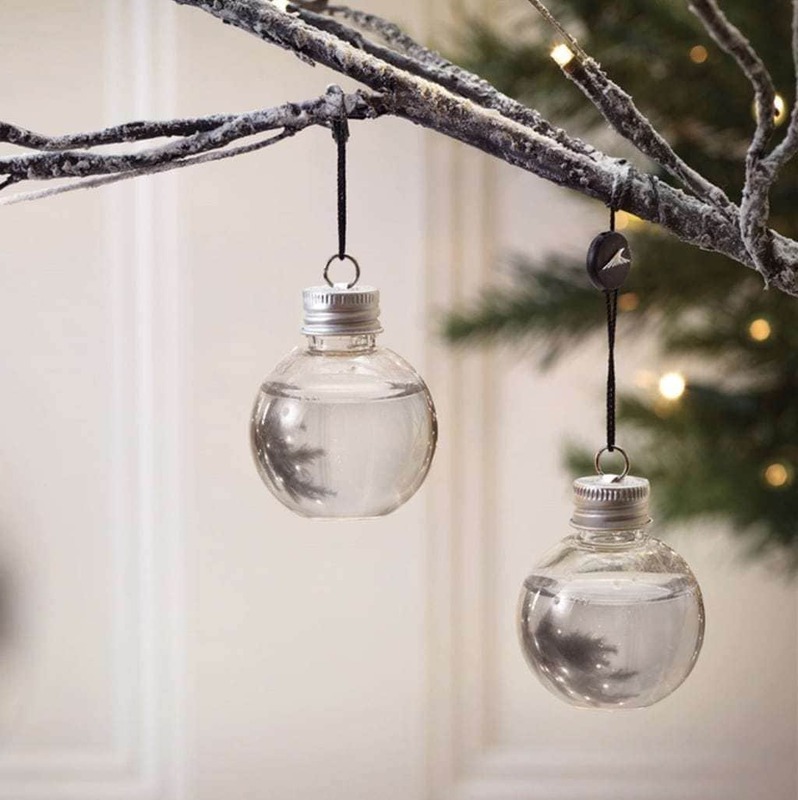 Nice pictures too.